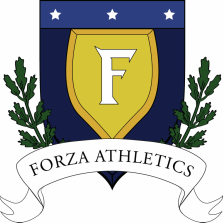 ​Our 2nd Forza Athletics season actually began with the conclusion of Luis’ senior season at Nazareth College. 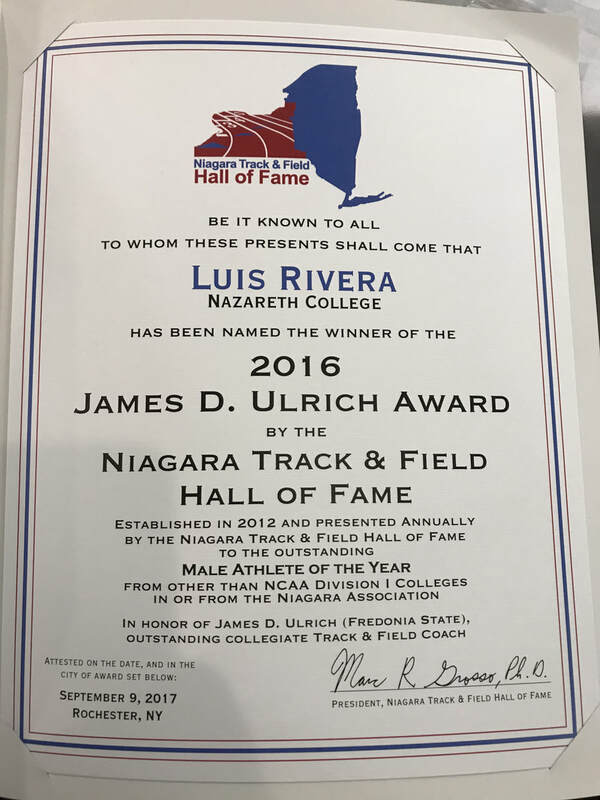 It was at this time that Luis was nominated for the James D. Ulrich USATF Niagara Division III Thrower of the Year. Luis had a very special senior season. 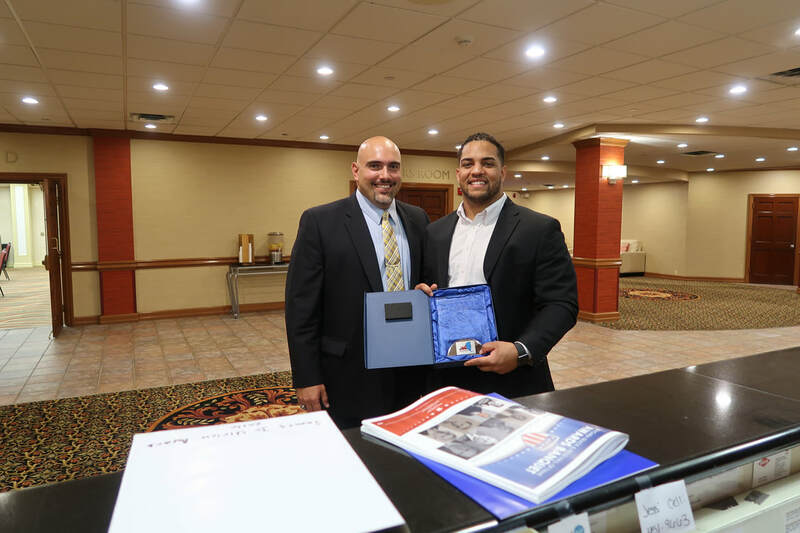 He won all 10 of his indoor meets, broke the Empire 8 and NYSCTFC Conference Weight Throw records, was awarded Atlantic Region Male Field Athlete of the Year, and won the 2016 Division III Weight Throw National Championship with a throw of 20.45m. That throw ranks Luis 6th all-time among Division III throwers. He also won Empire 8 and NYSCTFC titles in the Hammer throw, to go along with his 3rd place finish at the 2016 Outdoor National Championships. ​It was a very special moment for me for a couple of reasons. First, it was the first time one of my athletes had been nominated for and received a prestigious post-collegiate award. Second, Luis invited me to attend the awards ceremony with him. The second reason may sound funny, but athletes were only given one ticket for a guest to attend the ceremony-and Luis picked me! ​Luis made the move to Buffalo during the summer. That made training together a little bit more difficult for us, but it provided him a great opportunity to work with our high school athletes a couple of times a week when he was on campus for class. Our indoor season consisted of working with the following athletes on a consistent basis; Monique Hardy and Andrew Palermo. Monique just completed her sophomore year at Webster Thomas High School. Andrew will be attending Dartmouth College in the fall. You are able to view some throws from their training sessions on Luis’ Instagram and Twitter account’s @luis4real. Monique and Andrew had fantastic indoor track & field season’s! Both athletes broke the Section V record in the 20# and 25# weight throws. Monique threw 56’1” at the Section V State Qualifier Meet. 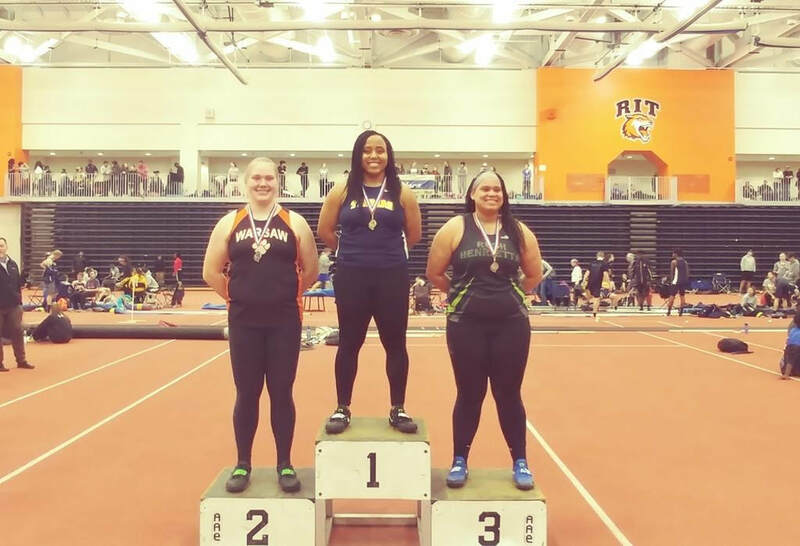 Monique won her County and Sectional meets as well, capping off her season with a New York State Championship in the 20# weight throw. Monique finished 4th at the New Balance Indoor National Championships. She also broke the New York State sophomore class record. Her throw of 56’1” ranked Monique #4 in the country and #1 sophomore. ​Andrew threw 70’ at the New Balance Indoor National Championships, placing him 4th! He also won his Sectional and State Qualifier meet, finishing 3rd at the New York State Championships. Andrew is only the fourth male thrower in New York State to throw the shot-put 50’ and the 25# weight 70’. Not to be outdone with his prolific weight throw marks, Andrew also won the shot-put at his sectional meet. ​Additionally, two new high school athletes trained with the Forza Athletics family this season. Bailey Robinson and Lindsay Johnson. Both seniors achieved personal best throws in the 25# this season, with Lindsay finishing 3rd at the Section V state qualifier meet with a throw of 44'6", earning the opportunity to compete at the Indoor State Championships. Bailey broke the Wayne-Finger Lakes Class D 20# weight throw record with a throw of 42’. Luis built upon the indoor success he had last season by again throwing at the 2018 USATF Indoor National Championships. Luis placed 7th this year, capping off a season in which he fulfilled graduate school courses and acted as recruiting coordinator for our collegiate program. Qualifying for and making the finals of the USATF Indoor National Championships while maintaining an internship, full-time course work, and a graduate assistant position made for a remarkable indoor season. ​Our outdoor focus began when the majority of the high school season was completed. Luis and I began working with Monique after her dual-meet season was completed. Our initial focus was to develop rhythm and establish technique in the hammer after having not thrown the weight/hammer in 3 months. Monique opened her outdoor campaign with the New Balance Outdoor National Championships. She did not disappoint, finishing 2nd with a throw of 56.12m, just 10cm away from the National Champion. Her throw broke the New York State sophomore class record, as well as placing her #4 all-time in New York State. 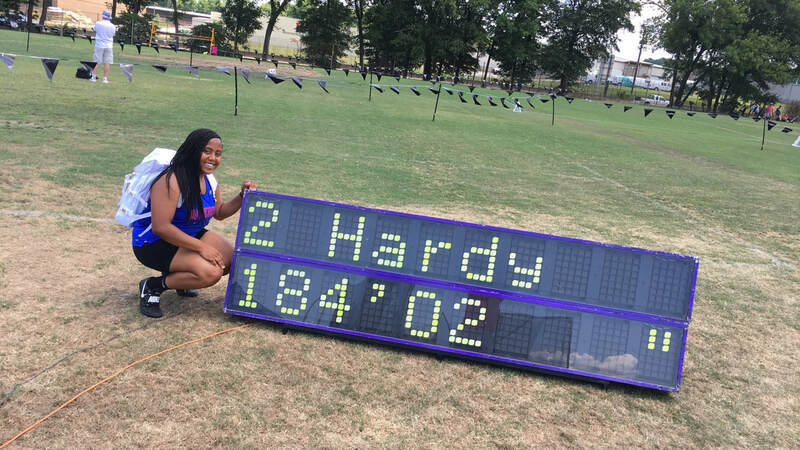 She continued to build upon her season by winning the USATF Junior Olympic Regional Qualifying meet by throwing 53.05m (new meet record). 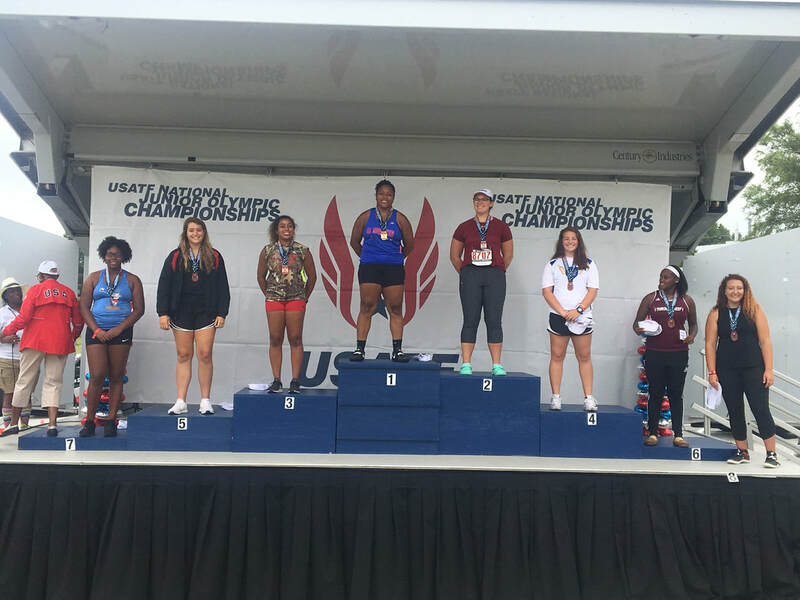 Monique recently completed her outdoor season by winning the 2017-18 USATF Junior Olympic 17-18 yr. old Hammer competition in Greensboro, North Carolina. Her throw placed Monique as the #1 sophomore in the country, #4 overall in the hammer. ​Reflecting back on this season, I count my blessings every day I have the opportunity to coach young athletes that are focused on becoming more efficient and confident throwers. We want our throwers to grow and develop into better people as well, by interweaving “life” conversations during practice. The goal of some of our throwers is to one day compete at the Division I or Division II level. Besides assisting them with what the decision may come down to (distance thrown), we guide our athletes in many other ways. We take time during practice to discuss some of the many factors that may play a role in that decision, such as; grades, SAT/ACT scores, intended major, distance from home, visits, how well they may get along with the current throwers on the team, how well they may get along with the current coach, and financial aid just to name a few. Many other factors may play a role in the decision, which is why we openly discuss these topics with our athletes. If you are a local athlete, and are interested in joining our throwing family, please contact me or Luis. We are more than happy to answer any questions you may have about joining our club team, when we practice, where we practice, and our summer competition schedule. Or better yet, you can contact the throwers we have previously or currently coach. They would be able to answer your questions as well. It is difficult to gauge how an athlete will respond to extended season, especially an extended high school season. In New York, the high school season typically ends around the first week of June with the state championships. The weekend after that the New Balance High School Nationals are held. Then, if an athlete qualifies, the Junior Olympics are held the third week of July. For some, the season begins in late October. How an athlete embraces the extended season makes a significant difference in the success that athlete has. The dedication and determination to continue throwing well into the summer is something to be admired. The mystery of success makes the process all the more enjoyable. And for Monique Hardy, the process was well worth embracing and extremely satisfying. You see, Monique just completed her sophomore season at Webster Thomas High School by winning the 17-18 year old age group Hammer competition at the 2017-18 USATF Junior Olympics on Monday. Her winning throw of 51.95m came in round 6, locking up her first National Championship. I would like to tell you about the last couple of weeks of training with Ms. Monique Hardy. Monique is a sophomore at Webster Thomas High School. She started throwing the weight and hammer last year. It would be an understatement to say that Monique has taken quite nicely to throwing the weight and hammer. I don’t believe it is that far-fetched to say that Monique is one of the most talented high school throwers in the country. She finished fourth at the New Balance High School Indoor National Championships this past March in the 20# Weight Throw and holds a personal best of 56’3”. Yesterday, at the New Balance High School Outdoor National Championships she threw the hammer 56.15m and finished 2nd. Last Sunday at a USATF sanctioned meet held at Roberts Wesleyan College, Monique threw a personal best of 49.86m. In seven days, she added about 25’ to that distance. One of the text messages I recently received from a coach asked, “How did you do that?” It is very simple, Monique did all the work. We don’t mark every throw in practice. We know which throws are the good one’s based on what Monique tells me. The prettiest ones don’t always go the farthest. The poor mechanical throws go far sometimes too. The cues we gave Monique to focus on during the competition were; 1) increase speed on second wind, and 2) push hard into the first turn. Nothing very complicated or elaborate. Monique is a very dedicated thrower. She is very engaged in practice. Rarely, if ever, does she check her phone or lose focus in what we are doing. At times, I can’t get my college athletes take two throws without looking at their phones. The secret lies in her work ethic. She watches throwing videos of herself and elite world class throwers. She is committed to getting the most out of every practice, even when we have some poor ones. I’m proud of the fact that I coach Monique. Thank you for giving me the opportunity to coach you. Just when we thought we were through with snow storms in Western, NY, Mother Nature decided to throw us a curve ball on the eve of the 2018 Indoor New York State Track & Field Championships. Unfortunately, due to the weather, some athletes from across the state were either unable to make it the Ocean Breeze venue in time to compete, or in some cases a couple of Section's did not travel to the meet at all. For two Forza athletes, the weather was not able to deny them a chance to compete in the weight throw and shot-put competitions. Not much more can be said about Drew Palermo and Monique Hardy. Competing at this indoor championship meet was a culmination of all the hard work, time, and effort they put in, beginning at the end of the 2017 outdoor season. A lot of throwers say they want to be great. They say they want to be champions. They say they want to win. However, most are not willing to do what it takes to win. They aren't willing to do what it takes to prepare their bodies and minds for the process it takes to accomplish the goal of being a champion. Drew and Monique have 'it'. They have that look in their eyes that tells you they are willing to get an extra training session in, not skip their weightlifting sessions, and watch video to ensure they are doing everything they can to be champions. They don't need to tell people what they are doing. They show it. They show up everyday; focused, ready to learn, willing to ask questions, and knowing they are going to make mistakes. Congratulations on a fantastic indoor state championship meet. Four events entered, four events medaled in. 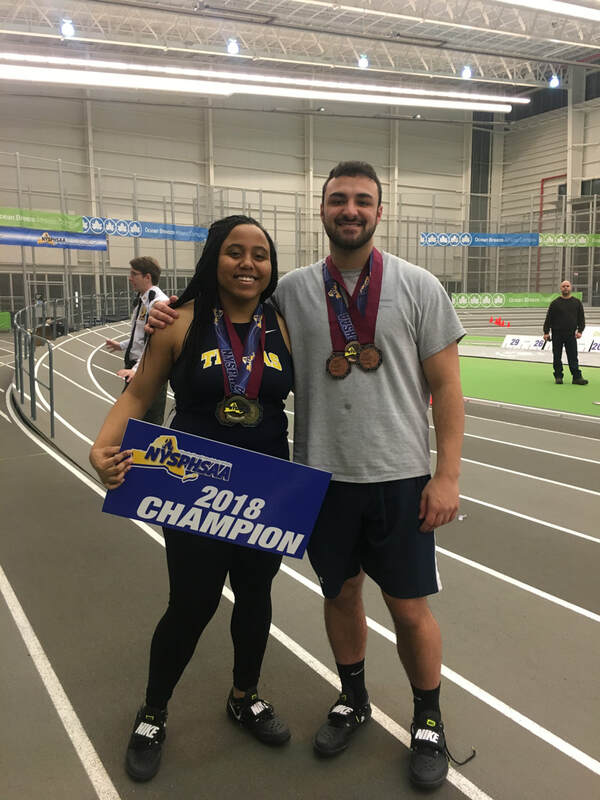 Pictured below-Webster Thomas sophomore Monique Hardy (1st in weight throw/5th in shot-put) and Spencerport senior and Dartmouth bound Drew Palermo (3rd in weight throw/8th in shot-put). It is said every four years that the most difficult team to make is the Olympic Men's and Women's United States track & field teams. With only three Olympic spots available per event, more often than not there are more than three athletes that can realistically secure those spots. Specifically, the men's Shot-Put seems to have four or five throwers competing every Olympic year that have a chance to finish in the top 3, as well as be considered a favorite to bring home an Olympic medal. In that particular case, of course throwing far matters most on that specific day, the Olympic Trials. Closer to home, and arguably the most important meet of the season for local high school athletes, the Section V Indoor track & field state qualifier meet was held this past Friday, February 23rd. The top 12-14 athletes in each field event compete for two automatic spots to represent Section V at the Indoor New York State championship meet. The third place finisher also qualifies as long as they have met the minimum standard. 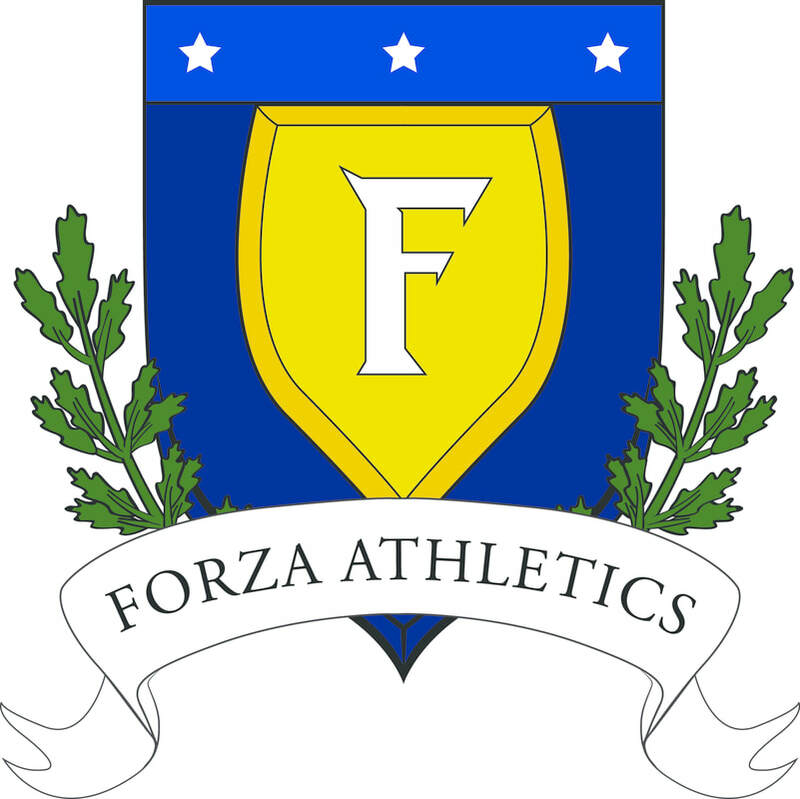 In total, four Forza Athletics throwers competed in the men's shot-put and weight throw, as well as the women's shot-put and weight throw. 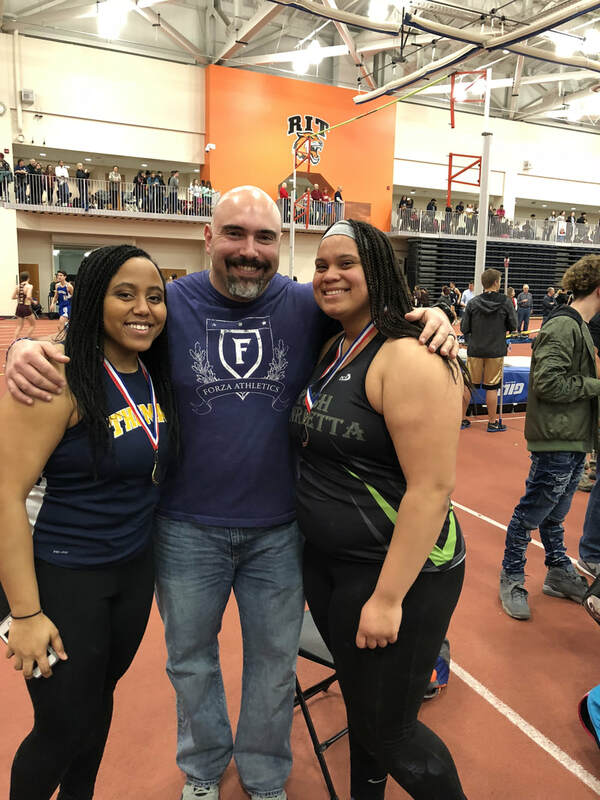 I'm proud to say that three of the four Forza Athletics high school throwers secured spots to compete in the New York State Indoor track & field championships on March 3rd in New York City. Setting a new Section V record in the women's weight throw, Webster Thomas sophomore Monique Hardy finished first with a throw of 56'1". Lindsay Johnson, a senior at Rush-Henrietta, finished third with a personal best throw of 44'7". They will both competing in the women's weight throw. Both Monique and Lindsay will also be competing in the women's shot-put. Lindsay finished 2nd, while Monique finished 3rd. Earlier in the season Monique threw the minimum qualifier of 37'7". 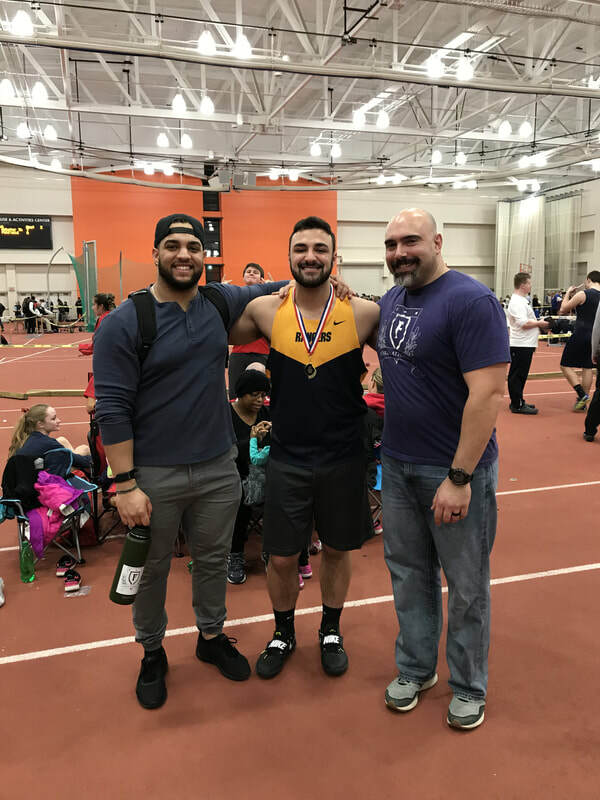 Joining his Forza teammates in New York City next weekend, senior thrower from Spencerport High School Drew Palermo will be competing in the men's weight throw and shot-put competitions. Drew finished first in the men's weight throw will a final round throw of 68', while finishing second in the shot-put. I cannot begin to express how proud I am to say that I have had the wonderful opportunity to coach these athletes this indoor season. We make most of the time we have together each week, maximizing our reps and really dialing in our focus on the smaller puzzle pieces that will assist them in reaching their throwing goals. Our coaching sessions go far beyond just throwing for the sake of throwing. Luis and I spend a great deal of time reviewing throwing videos, implementing plans for our throwers, and most importantly discussing our plans with our throwers. We value the input our throwers give us, especially when it comes to their needs, how they are feeling, and what they think they need to focus on in order to throw farther. 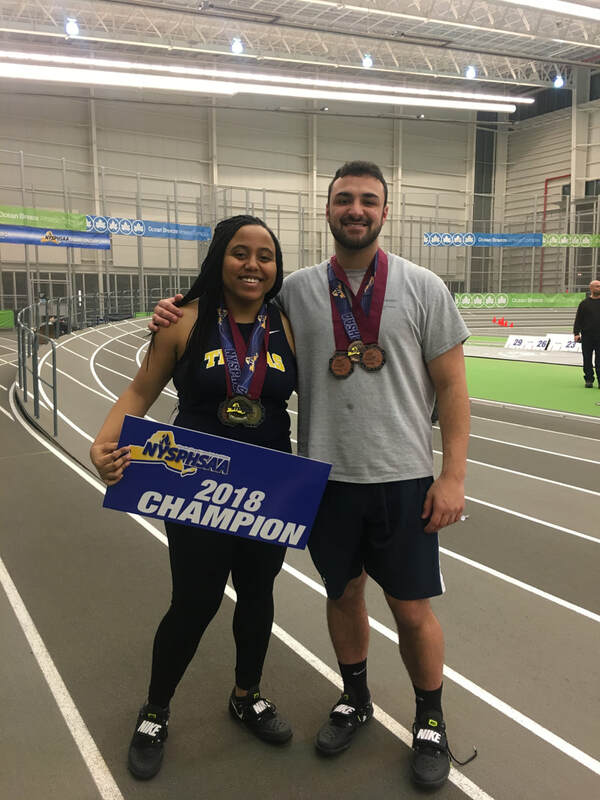 Best wishes go out to our throwers and all the throwers competing at the New York State Indoor track & field championships this weekend. Breaking a sports record of any kind, for most, might be the culmination of a wonderful and memorable experience. Chasing the record. The pursuit of excellence. And then, something happens. The record is broken. The chase, the thrill, and the exhilaration are met with a multitude of emotions-exuberance, excitement, and a sense of fulfillment. But then what? If the sole focus of the competition is to break the record, we may feel overcome with joy for a moment, but then what? A fine balance exists between chasing records and chasing accomplishments. One can accomplish something without breaking a record, but yet the accomplishment and/or goal was accomplished. You can break a record, but not meet your goal. Emotionally, how does one prepare for such a situation? With the Olympics in full swing, journalists and reporters have been interviewing new and repeat Olympic gold medalist in a multitude of events. A common theme that has emerged, from my perspective, is the satisfaction of winning a gold medal. One reporter interviewed someone about missing out on a chance to break the record, in which the athlete responded with, "The gold medal will be mine forever. Someone will always be able to break the record later." Much can be said with track and field athletes. Most would prefer to win an Olympic gold medal because nobody will ever be able to take that away from them. Breaking a record, well, someone can always do that later. Webster Thomas Sophomore Monique Hardy with a new Section V and New York State Sophomore class record with a throw 55'3". Video credit to Webster Thomas High School. 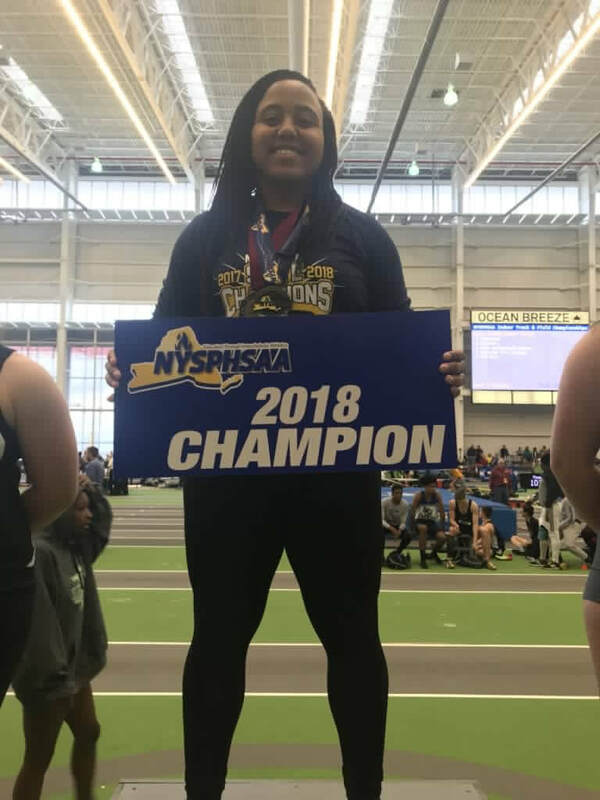 As you can see from the video posted above, Webster Thomas High School Sophomore Monique Hardy has once again bettered the Section V and New York State Sophomore Class record in the 20# Weight Throw. I think for most athletes, breaking both records would suffice as having a successful season. Monique, however, is not like most athletes. The drive, determination, and focus this young lady has is pushing her to heights not reached in New York for over a decade. She is quietly erasing records set many years ago, while keeping her sights set on much more profound opportunities-qualifying for the New York State Indoor Track and Field Championships and traveling to the famous Armory in New York City, to compete in the New Balance High School Track and Field National Championships in March. The record is nice, however it is merely a by product of chasing a much greater and stoic outcome. For now, we'll leave the record written in pencil, just in case Monique has plans for bettering it while continuing with this monumental season. The plan was set. The wheels put in motion. We were primed for a fantastic performance. Warm up went well. We were loose. We were ready. We stepped in the circle. Unlike past performances, it just wasn’t there. When performances do not go as planned, how do we as coaches handle that situation with our athletes? Do you give your athletes time to think about it? Do you engage your athlete(s) immediately after the poor performance? Have you ever sat down with like-minded individuals for hours and talked about the topics you are most passionate about? When was the last time that happened? What was the topic of conversation? How long did you talk? Let’s just say it has been a very, very, very long time since I saw the other side of 1am. Usually I don’t see the other side of 11pm, but this weekend was different. This weekend Luis and I traveled to Columbus, OH to compete in the Buckeye Classic. After the competition was completed, Luis and I joined some athletes and coaches for dinner. Once dinner was wrapped up, Luis and I went back to our hotel, got cleaned up, and met with a smaller group of coaches to talk throwing. I could have spent many more hours learning from the other coaches I was with. With the onset and prevalence of social media, it makes learning from individuals very easy-as long as you know how to sort the good info from the better info. However, there is something so much more personal about sitting down with and speaking to others face-to-face. One coach and I spent about an hour with me talking about the importance of helping your athletes focus on themselves, what they are doing, and how they can get better. This coach and I are about the same age, competed before Twitter, Facebook, and Instagram were invented. We weren’t able to watch or post videos anywhere. In 2018, anyone can post anything they want anytime they want. Anyone, anywhere in the world can view, in this case, throwing videos of others as soon as they are posted. Essentially, we spoke about controlling what you have control over. A thrower in New York cannot control what a thrower in Florida is doing. With the advent of rankings and lists, one can see what others are doing across the country. However, those are just marks. In the chances that the thrower from New York and thrower from Florida compete in the same meet, those marks are just marks. Just as any other meet-what you did before does not mean that is what you will do again. My biggest takeaway from speaking to many coaches and athletes this weekend was trust. Trusting your coach, trusting your abilities, and trusting yourself that you have prepared the best you can in order to be successful (however you may define your success). The start to the 2017-18 high school Indoor Track & Field season could not have been scripted any better. On Friday, December 8th, 2017, Spencerport senior and Dartmouth bound Drew Palermo broke the Section V 25# men's weight throw record with a massive toss of 68'7". Drew's throw broke the previous Section V record by over 6'. His throw is currently the #1 men's high school 25# weight throw in the United States! Not to be outdone, Webster Thomas sophomore Monique Hardy broke the Section V 20# women's weight throw record with a throw of 51'.25". Monique's throw is currently the #1 women's 20# weight throw in the United States! Below you can watch Monique break the Section V 20# weight throw record at the Rochester Institute of Technology on Friday, December 15th, 2017. Below you can view Drew's Section V 25# weight throw record throw from SUNY Brockport on Friday, December 8th, 2017.